The expansive collections of the National Railway Museum fill galleries, halls and brick warehouses — designed to look like train depots — on two sides of Leeman Road in York. Over a million artifacts bring the nostalgia and necessity of 300 years of rail travel to life: giant clocks, postcards, piles of vintage luggage, tickets, toys and models, as well as 300 carefully restored rail vehicles. In the gallery attached to the glass-topped Station Hall, the former main goods station in York, exhibits showcase train art. Rotating exhibits at the museum detail how rail lines were installed, and videos alongside stalled salon cars bring passenger travel to life. In the Great Hall, step inside the Shinkansen — the world’s first bullet train, reaching speeds of up to 130 miles per hour, and built in Japan in the 1960s — and peer in on the ornate interior detailing of the art deco-styled Dutchess of Hamilton, built in the 1930s. The hall is also home to the power car of a Eurostar, a black and blue shiny laquer Mallard steam locomotive popular in the mid 1900s, and a second class carriage from an early 1800s passenger train. Most afternoons after 3pm, museum staff conduct tours and share stories from inside several of its most popular vehicles. 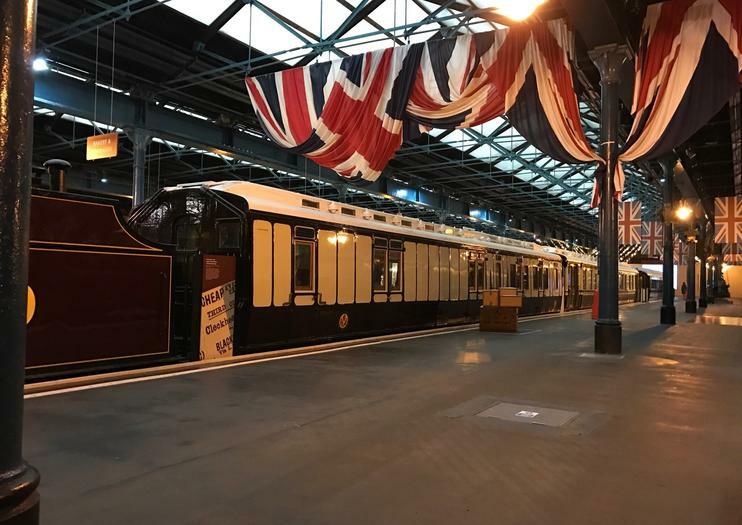 The National Railway Museum in York is the larger of two UK museums dedicated to rail travel — the other is 60 miles north in Shildon and both are free to the public. This location, a half-mile west of downtown York on Leeman Road, is open daily from 10am until 6pm year-round (closed Dec. 24-26). A footbridge connects present day York station to the museum and the Rawcliffe Park & Ride bus stops in front of the museum. The museum has a gift shop and restaurant/café serving sandwiches and hot drinks. A regular roster of new events, exhibitions, talks, and tours populate the museum calendar, so check to see what’s happening before arriving.